Do you want to know where you spent most of your time? 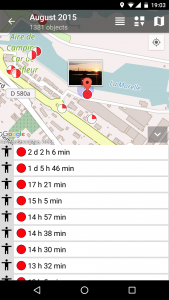 This is quite easy if you are using PhotoMap. You just need to tap on a group, e.g. ‘2016’, ‘August 2015’, ‘Last 7 Days’, and select the view mode ‘Map’. Tap on the ‘arrow up’ button if not already done before and select ‘Duration of Stay’ in the upper menu. PhotoMap will show you a list of visited places with the ‘Duration of Stay’ as seen in the screenshot below. Just tap on one of the list items, e.g. on ‘2 d 2 h 6 min’, to see the location on the map. HINT: This feature only works for time periods where you have activated PhotoMap’s integrated geologger. You can activate it by tapping on the interval timer at the top of the left main menu. Please check the box ‘Log Geo Positions’. Activate the location updates checkbox and select an interval, e.g. 10 minutes, to get better results. The lower the interval (e.g. 1 minute) the higher the energy consumption. 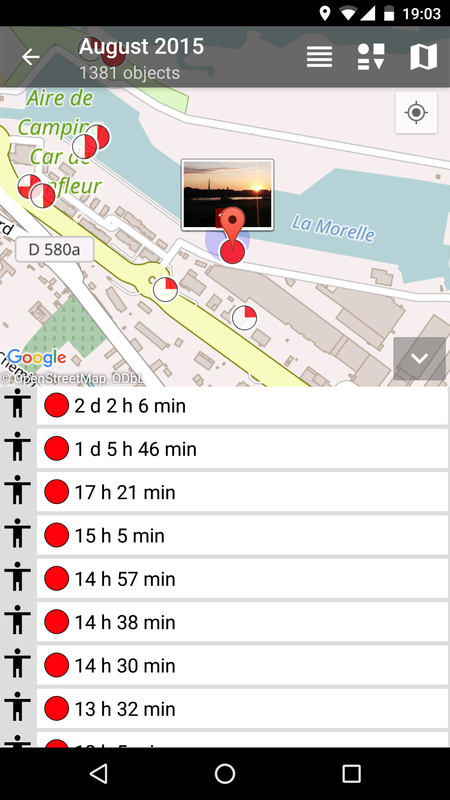 I highly recommend to use PhotoMap’s interval timer widget on your homescreen for a fast and easy adjustment of the geologger. Do you like this feature? Please let me know if you have any suggestions. Previous story How Far Have I Traveled? View Distances Daily, Weekly, Trip-based and More.